According to a new market report published by Transparency Market Research titled “Aerial Work Platform Market ((Product – Scissor Lift, Boom Lift (Articulated Boom Lifts, Telescopic Boom Lifts), Others; End-user – Construction (Commercial, Residential), Industrial & Manufacturing, Maintenance &Repairs, Others; Structure – Standard and Insulated) – Global Industry Analysis, Size, Share, Growth, Trends, and Forecast, 2018 - 2026,” the global aerial work platform market is expected to reach a value of US$ 8,695 Mn by 2026. In terms of value, the market is estimated to expand at a CAGR of 6.1% during the forecast period from 2018 to 2026. In terms of volume, the market stood at around 83,799 Units in 2017. The Asia Pacific aerial work platform market is projected to witness the highest growth during the forecast period both in terms of value (US$ Mn) and volume (Units). 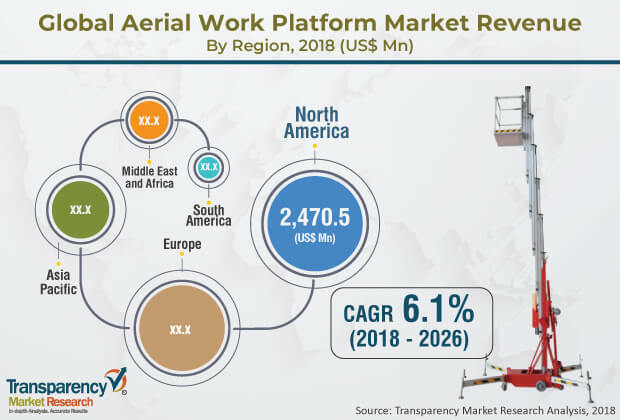 The market witnessed considerable growth in this region because of increasing demand for aerial work platforms due to improving infrastructure development. The aerial work platform market is influenced by market dynamics with the prime driving factor being increasing safety standards worldwide. In terms of product, the boom lifts segment is anticipated to gain the largest share with total value of US$ 4,684 Mn by 2026 at a CAGR of 6.4% annually. However, high pricing of the aerial work platform is one of the major challenges restraining the growth of the market. However, the market is anticipated to grow as a result of entry of new players. In 2017, based on product, the boom lifts segment accounted for market value of about US$ 2,706.2 Mn in the global aerial work platform market. This is because boom lifts are very common in established markets such as Western Europe and North America, where they are widely used for indoor, general construction as well as for various other industrial applications. In terms of end-user, the construction segment is anticipated to reach US$ 6,297.8 Mn at a CAGR of 6.0%in 2026.The construction industry is expected to register steady growth due to high rate of urbanization in emerging countries of Asia Pacific, coupled with increasing population. Rapid growth in the residential sector in urban as well as semi-urban areas in this region contributes significantly to the market growth. In terms of structure, the standard segment is anticipated to dominate the global aerial work platforms market due to growing demand from the construction sector. The standard AWP market is anticipated to reach US$ 7,492.8 Mn in 2026 at a CAGR of 6.0%. The top companies considered while studying this report for the global aerial work platform market are Aichi Corporation, Altec Inc., Bronto Skylift, Diversified Technologies., Haulotte Group, JLG Industries, MEC Aerial Work Platforms, Oshkosh Corporation, Palfinger AG, Skyjack (Linamar Corporation), Tadano Ltd., and Terex Corporation.